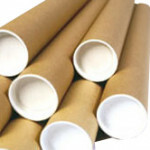 MIDPAC Packaging stock 4 sizes of Postal Tubes suitable for posting various items through the post or by courier. All of our Postal Tubes are supplied with white plastic end caps. For different sized tubes or Coloured Postal Tubes we can have those produced for you, however minimum quantities will apply. Printed Postal Tubes are available printed with your own company logo. Please contact the Midpac team on Coventry 024 7647 3647 or email sales@midpac.co.uk for further information.